Editor’s note: Today we have the first entry in another series of posts chronicling a major climb by Steve House. 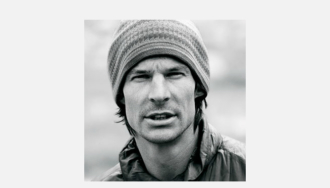 Steve, along with fellow Patagonia ambassadors Vince Anderson and Marko Prezelj, will be attempting the unclimbed West Face of Makalu come September. They received grant funding from the Mugs Stump Award, American Alpine Club and Slovene Alpine Club. Previously, a Russian team climbed the right edge of the wall using fixed ropes. Their line veered off the face at half-height to join the west ridge. 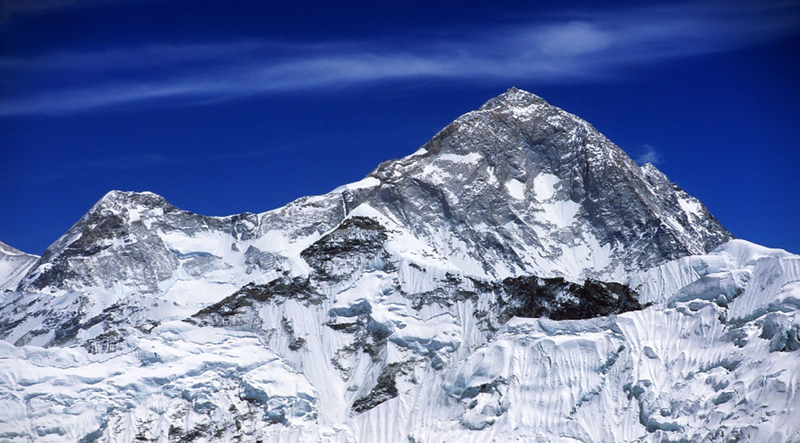 Sadly two of the nine climbers died on the final ascent and descent. “How’s your workout going?” asks the smiling balding guy whose cut-sleeve T-shirt reveals thick, hunched shoulders and arms sprouting grapefruit-sized biceps. I’m in the Redmond Athletic Club, a converted warehouse that is central Oregon’s heartland for metal heads. I’m not talking about Metallica fans. I mean weight lifters. At 4 pm I’m the smallest person in the gym. Even the women look like they are capable of palming my tiny hiney and pressing me above their heads with one arm. Eying the weights I need for my next exercise I shuffle quickly past a pair of brutes curling dumbbells the size of new-born calves. “Yeah, I know.” I lie. My day had started early. I woke at 6:30 and donned a pair of Long-Haul Runners and an Airius-T. Then I put the kettle on the stove and checked the temperature outside: 58 degrees. Wow, warm already! Once the water boiled, I gulped down instant oatmeal flavored with espresso-GU and green tea (you gotta to train your body to accept the food it’s going to get on the mountain). Then, wearing a worn-out pair of big-mountain boots and a trashed out backpack, I jumped on my motorcycle and headed for the trailhead. I jogged down the trail, clomping clumsily along in the heavy boots, until I reached the Crooked River. I reached the other side after skipping across the many exposed black basalt boulders, and started up a short, steep hill. With the first bead of sweat, I glanced at my heart-rate monitor: 110 beats per minute. I opened up my stride and my chest heaved to bring in more air. After topping the hill, I dumped out the contents of my pack: three collapsible five-gallon water containers, grandpa’s old aluminum saucepan, a liter of ice water and five more packets of GU. With the saucepan and the first jug, I tripped down to the irrigation canal that cuts through the base of this hillside. Above me loomed Burma hill — 1,500 feet of steep, loose pea-to-fist-sized gravel –- the perfect site for my long interval sessions. Today I carried 20% of my body weight in water for 30 minutes while keeping my heart rate between 135 and 150. At the top of each run, I dumped the water into the thirsty sage-brush and skipped back down to gather the next load. Each ascent took a half hour, each descent, 15 minutes. Three hours later I parked the bike in the afternoon shade back home. Inside, all I could think about was food! Butter sizzling, I cooked down a healthy handful of whole spinach before cracking three eggs into it. After adding four hungry-man slices of toast, slathered with a whole ripe avocado, I started to feel at peace again. Hunger sated, I showered and woke up the computer. After checking out the latest entry on The Cleanest Line I got to the business in my email inbox. An hour later, I headed back to the bedroom and laid down on top of the covers –- nothing like a recovery nap between workouts. I blinked myself awake after 90 minutes of rest. It was time to eat again before hitting the gym. As bench-press guy lays back down to pump out another set of a dozen, I mount my bar on my shoulders. With one foot up on a wooden box, I step up, driving the weight upwards. The effort, close to my maximum, feels powerful. Ritualistically, I tap the back of my right foot with my left toe, proving my control, and step back down. This time it is the weight that drives me down. I work to control it, get my left foot squarely on the floor, and breathe out as I do the next rep.
After 90 more minutes of exercise, the routine will repeat itself: ride home, eat, then the daily chores of shopping, email, more eating, and an early night’s sleep. Tomorrow is a rest day. I look forward to not feeling fatigued all day. With a fresh, rested brain I can get some work done on completing the K7 West film that we’re going to launch soon. Spending a day at the desk will be a treat.